Was asked to go to an atas art launch at Suntec. Really very atas leh. There were Botero’s sculptures. There was also a small piece by Yoshitomo Nara at an unnoticeable corner, and so small you would miss it and there wasn’t even a tag to tell you the details of the painter. (yeah lah, japanese are like that, very un-ostentious.) When I saw the Nara piece, I thought it was an imitation. Like, come on, how can they have a Nara piece here? It is drawn behind a small envelope in color pencil. So I asked for the price. $35, 000. Wah lao eh, it’s authentic! I realize only the Japanese paintings don’t have prices on them; the Japs are very subtle people huh. If I had the money, I’d have bought it. Good investment and besides, You know it’s hard to carry gold bars during war. Easier to carry an envelope mah. But might burn lah. But my purpose at the art exhibition was to EAT. You should see how unglam I was. Everyone was in suits and ties, and I wasn’t. Then, I was so yao-gui (hungry ghost) I was carrying 3 chicken pies in my hand, while eating a mozzarella stick with my other hand. I stuffed my face with the food and ignored the wine. My friend once told me it’s horrible being a teetotaler because drinking wine is a kind of high-class lifestyle too. Ok lah, as you can tell, I don’t really care about my image so long as I enjoy myself. But I like champagne; it’s like soft drinks. So anyway, not finding any hot, rich and gay men there–must satisfy all three criteria ok? some only have two, cannot–we went to Sizzler for dinner. EPIC FAIL. Because I already ate so much at the art launch, I wanted to share with another friend. And the waitress said it was the company policy that there isn’t sharing. After a few minutes of wisecrack from me, she said, “We are buffet-style here.” Ooooh, she could have mentioned that right at the start; it could have prevented a lot of misunderstanding. We didn’t know that Sizzler is a buffet restaurant; we thought it is just a steak restaurant. What I want to know is why Sizzler didn’t mention it explicitly at the entrance or the menu, in big bold fonts, and bright lights. Who knows that Sizzler is a buffet place?! And why can’t they just allow us to order steak a-la-carte without including the buffet in it? The rules of restaurant just don’t make sense. Then the friend whom I was sharing with said she didn’t want it anymore. And I said, “何少 (Master Ho, that is, me) also doesn’t want it too then.” If my friend wasn’t eating, then what was the point of having dinner together? You see, even when I am angry, I am funny. Heh heh heh. Then another friend didn’t want it too. And then another friend. So we four wanted to leave for another restaurant. But the other two friends wanted to stay and one of whom was throwing a tantrum. You could see her whole face red with anger, waiting to burst. So one of us stayed behind to pacify her; and in the end, three of us went to crystal jade. I was so apologetic to my friends that I kept saying sorry, sorry to them that I was such a troublemaker. But I believe in standing up for what I believe in; there are certain truths that we cannot ignore; if it is the right thing to do, I won’t avoid doing it. I rather feel bad and do the right thing; than to feel bad not doing the right thing. So for the record, I LOVE CRYSTAL JADE. It’s bringing affordable good Chinese food to the masses. UP WITH THE MASSES, down with the bourgeoisie! We each ordered a bowl of noodles and a few dishes to share. My friend recommended the above dish, a deepfried tofu with fish-fingers skin. And it tasted exactly like that. Very tasty. 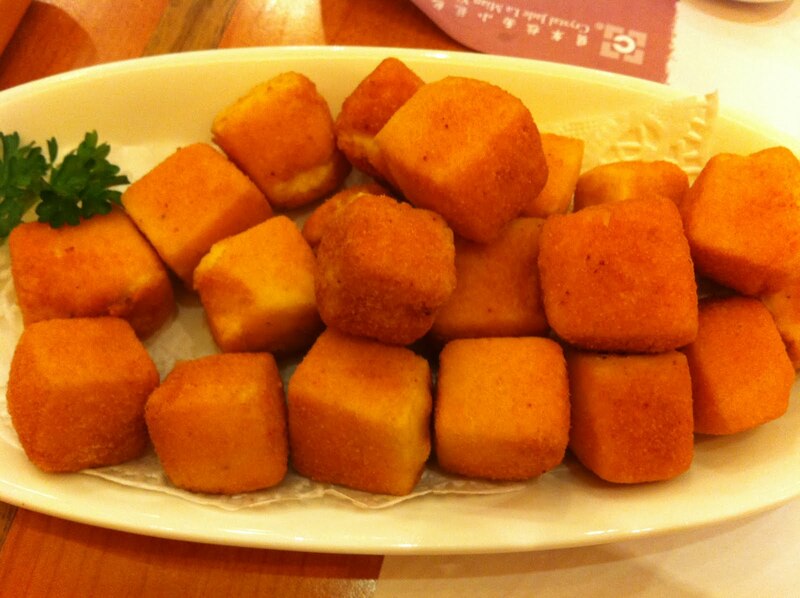 The saltiness of the skin flavors the blandness of the tofu. 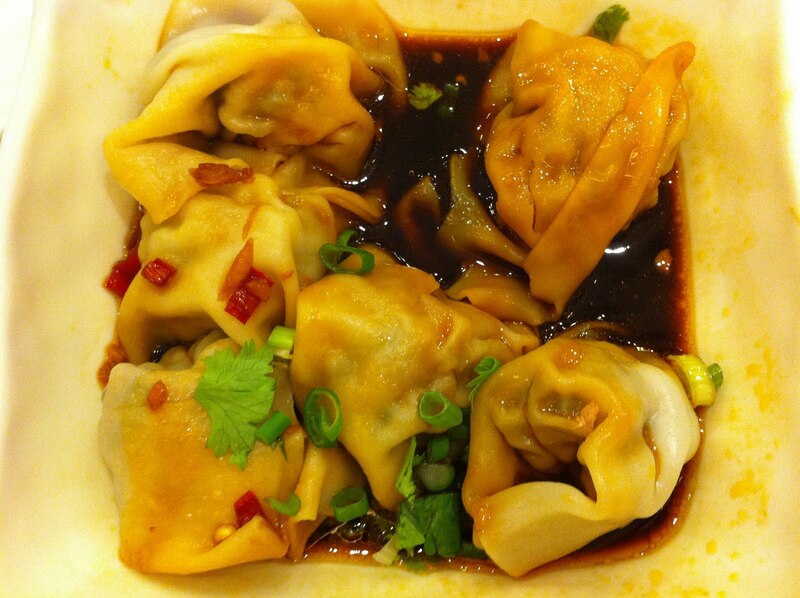 I wanted something spicy, so I ordered this spicy dumplings. Edible. Nothing special, but nothing amiss too. My other friend said how can we come to crystal jade without ordering xiao long bao? But 5 is a bit hard to share among three people. 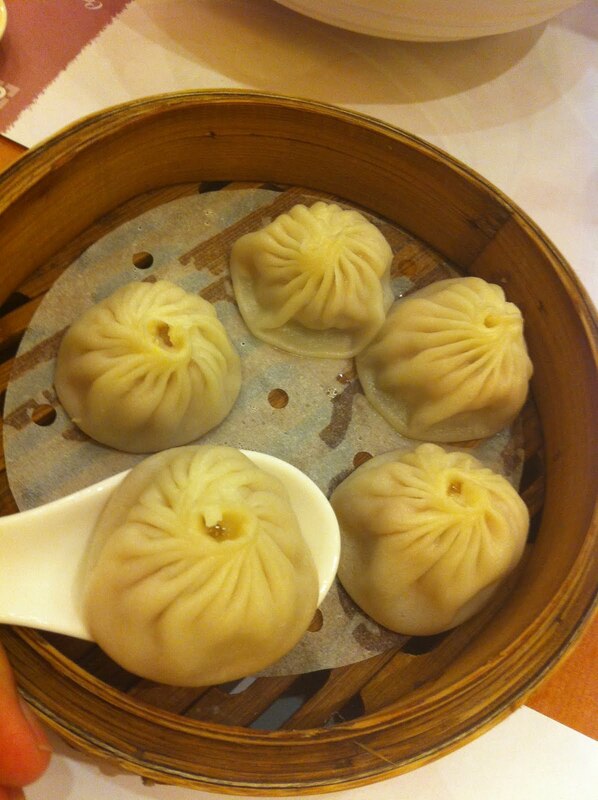 The dish was still good, but somehow I don’t quite fancy xiao long bao anymore. All in all, an enjoyable and affordable meal at $14/pax.